Wellbutrin (bupropion) is an atypical antidepressant with a lower reported rate of withdrawal syndrome compared to the SSRIs and SNRIs such as Paxil, Effexor, or Cymbalta. However, patients have reported withdrawal symptoms, sometimes severe, from too-short tapering. Bupropion is a bit of an oddball because it "is thought to be" a dopamine and norepinephrine reuptake inhibitor and a nicotinic receptor antagonist, which is why it is sometimes used to help people stop smoking. Like Chantix, as a smoking cessation aid (Zyban), bupropion has been found to cause suicidal thoughts or actions and displays an FDA black box warning accordingly. Bupropion tends to be energizing and often causes anxiety, agitation, nervousness, loss of appetite, and insomnia as side effects. Bupropion usually is not an appropriate treatment for withdrawal symptoms, as it can aggravate them. Way back in ancient history, around the year 2000, it became apparent these fabulous wonder drugs, the SSRIs, which were supposed to alleviate depression with almost no side effects, had a huge drawback that might slow sales: They caused sexual dysfunction in a high percentage of those who took them. This caused great consternation among the pharmaceutical companies, who went through varying cycles of denying that sexual dysfunction was a frequent consequence of SSRIs, claiming the sexual dysfunction was due to the underlying depression, and searching for pharmaceutical solutions to this adverse effect. It was also observed that bupropion had fewer sexual side effects and that some patients found it sexually stimulating. Seizing the opportunity to preserve their sales, the drug companies initiated campaigns to educate doctors that, in the rare cases where sexual dysfunction was a problem, bupropion might be added to an SSRI to alleviate the problem. It did seem to help some, but its usefulness for this purpose is mostly a product of drug company propaganda. Also, to preserve sales of SSRIs, the drug companies neglected to inform doctors that being an antidepressant itself, Wellbutrin might replace the SSRI, and there was no reason to keep people on two drugs when one drug would do. This ushered in the era of the common combination of an SSRI, bupropion, and a benzo (or low-dose Seroquel) for many people complaining of any kind of "depression." As all of these drugs incur physiological dependency, this cocktail is very well represented on this site. Name-brand Wellbutrin or generic bupropion is available in 3 variations with different half-lives -- the amount of time they last in your body (see below). Name-brand Wellbutrin XL was manufactured by GlaxoSmithKline but is currently manufactured by Valeant Pharmaceuticals. Name-brand Wellbutrin SR is still manufactured by GlaxoSmithKline. Generic manufacturers also make their own versions of IR, SR, and XR or XL bupropion. There may be slight differences in formulation between brand-name Wellbutrin and the generic versions, and among the generic versions. For exact information about formulation of a generic version, you would have to contact the generic manufacturer. It is metabolized by P450 cyp2B6 liver enzyme, and conflicts with alcohol metabolism. Its half-life is complicated because it has a number of active metabolites and various versions that prolong release of the active ingredient. How gradually should I taper buproprion? There is little information about tapering off Wellbutrin, probably because it is assumed not much of a taper is needed. As with all other psychiatric medications, do not skip doses to taper. If you're susceptible to withdrawal symptoms, this is an excellent way to trigger them. Start with a 10% reduction per month, as we recommend with other antidepresssants. Base your decrease on the last dosage: The amount of the decrease keeps getting smaller. If you find 10%-per-month decreases cause no problem, you may wish to make them more often -- but no more often than every 2 weeks. If you get any kind of withdrawal symptom, stop tapering! You are either tapering too fast or making reductions that are too large. - To be taken once a day. 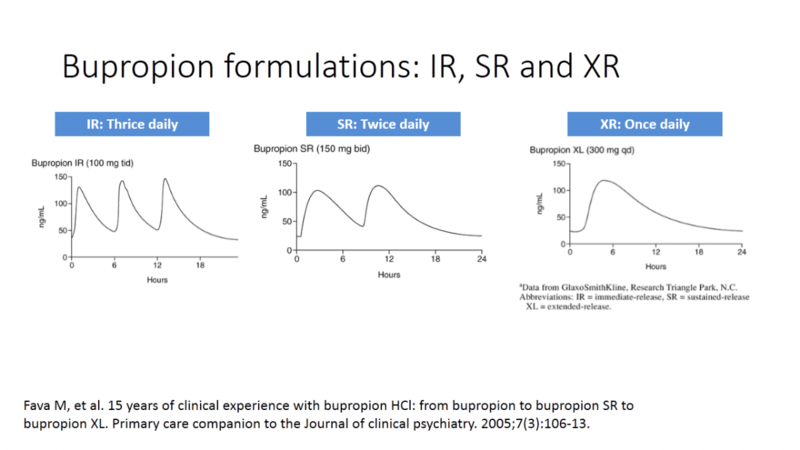 This is equivalent to 3-times daily immediate-release buproprion or twice-daily bupropion SR. Switching Patients from WELLBUTRIN Tablets or from WELLBUTRIN SR Sustained-Release Tablets: When switching patients from WELLBUTRIN Tablets to WELLBUTRIN XL or from WELLBUTRIN SR Sustained-Release Tablets to WELLBUTRIN XL, give the same total daily dose when possible. Patients who are currently being treated with WELLBUTRIN Tablets at 300 mg/day (for example, 100 mg 3 times a day) may be switched to WELLBUTRIN XL 300 mg once daily. Patients who are currently being treated with WELLBUTRIN SR Sustained-Release Tablets at 300 mg/day (for example, 150 mg twice daily) may be switched to WELLBUTRIN XL 300 mg once daily. The active substance is bupropion hydrochloride. WELLBUTRIN XR tablets come in different strengths. Each tablet contains either 150mg or 300mg of bupropion hydrochloride. - printing ink: shellac glaze, iron oxide black (E172) and ammonium hydroxide. If you cut up Wellbutrin or bupropion XR, what's inside is regular immediate-release bupropion. When you break the time-release coating, the tablet loses its extended-release characteristic and you would be taking immediate-release bupropion. For patients taking 300 mg/day....the dose should be tapered to 150 mg/day for 2 weeks prior to discontinuation. This suggests a taper of 50% for two weeks, then quit at 150mg. We recommend a more gradual taper than this. If you cut up a Wellbutrin XL or XR tablet, you get immediate-release bupropion. Since the smallest XL/XR tablet is 150mg, we recommend converting to bupropion SR or immediate-release bupropion so you can cut up the tablets to make reductions by 25mg or less. - To be taken once a day. This is equivalent to 3-times daily immediate-release bupropion or twice-daily bupropion SR. Same as tapering Wellbutrin XL or XR, above. Remember that if you cut up a Wellbutrin XL or XR tablet, you get immediate-release bupropion. You probably will not want to do that right off. If your system is used to the extended-release version, it may not react well to the "dumping" of immediate-release. By cutting the 75mg IR tablets in quarters, you can taper by a smaller amount than 10%, approximately 18.75mg (splitting tablets is not as precise as using a liquid). for the first part of the taper, you can remove one-quarter of a 75mg tablet at each step. As you are tapering by less than 10%, you may be able to go faster than monthly decreases. The minimum tapering interval we recommend is every 2 weeks. Reduction 1: 281.25mg per day -- a 150mg Wellbutrin XL tablet in the morning, a 75mg Wellbutrin IR tablet in the afternoon, and 3/4 of the second Wellbutrin IR tablet in the evening. Reduction 2: 262.5mg per day -- a 150mg Wellbutrin XL tablet in the morning, a 75mg Wellbutrin IR tablet in the afternoon, and 2/4 of the second Wellbutrin IR tablet in the evening. Reduction 3: 243.75mg per day -- a 150mg Wellbutrin XL tablet in the morning, a 75mg Wellbutrin IR tablet in the afternoon, and 1/4 of the second Wellbutrin IR tablet in the evening. As you're down to 1/4 of a tablet in the evening, you may wish to take the next quarter out of the first 75mg tablet to balance your daily dose. Reduction 4: 225mg per day -- a 150mg Wellbutrin XL tablet in the morning, 3/4 of 75mg Wellbutrin IR tablet in the afternoon, and 1/4 of a Wellbutrin IR tablet in the evening. Reduction 5: 206.25mg per day -- a 150mg Wellbutrin XL tablet in the morning, 2/4 of 75mg Wellbutrin IR tablet in the afternoon, and 1/4 of a Wellbutrin IR tablet in the evening. Reduction 6: 187.5mg per day -- a 150mg Wellbutrin XL tablet in the morning, 1/4 of 75mg Wellbutrin IR tablet in the afternoon, and 1/4 of a Wellbutrin IR tablet in the evening. Reduction 7: 168.75mg per day -- a 150mg Wellbutrin XL tablet in the morning, 1/4 of 75mg Wellbutrin IR tablet in the late afternoon. Reduction 8: 150mg per day -- a 150mg Wellbutrin XL tablet in the morning. Then you would make a liquid from the 100mg Wellbutrin IR tablet to make further reductions of 10% (based on current dosage; the amount of the decrease gets smaller and smaller) until you are down to one 100mg Wellbutrin SR per day. After you are down to 100mg per day, you may wish to make your next decrease by getting your prescription filled with 100mg Wellbutrin IR (immediate-release) tablets (or use the ones you have left) and make a liquid from them to continue tapering at 10%. "Data from the manufacturer states that dividing Wellbutrin SR® tablets resulted in an increased rate of release at 15 minutes: “However, the divided tablet retained its sustained-release characteristics with similar increases of released bupropion at each sampling point beyond 15 minutes when compared to the intact Wellbutrin SR® tablet...” Bupropion is hydroscopic and therefore should be stored in a dry place. Splitting of large quantities in advance of administration is not advised since loss of potency may result. If necessary, splitting should be done cleanly without crushing." In the name-brand Wellbutrin SR, the sustained-release quality is in the binder, the glue that holds the tablet together. Generic versions (which would be called bupropion SR, not Wellbutrin SR) may be made differently. Contact the manufacturer to find out exactly how the tablet is formulated, or talk to a pharmacist specializing in psychopharmacology. I personally found you CAN cut Wellbutrin SR (sustained release) tablets up -- the timed-release mechanism is mixed in with the drug. Put the pieces in a water-tight container and use them up within 24 hours because the time-release binder can absorb humidity and degrade. To taper, convert your dosage to 100mg SR tablets, cut up the 100mg tablets, make reductions by 25mg or less, take 2 times a day. As immediate-release tablets come in the smallest dosage of 75mg, which can be quartered into pieces of 18.75mg, you might want to convert part of your daily dose to IR tablets. This will enable you to taper by 18.75mg at a time. You might be able to get by with taking the SR tablet in the morning and the IR tablet at night. - "Bupropion should be administered 3 times daily, preferably with at least 6 hours between successive doses." To taper, cut a 75mg or 100mg tablet into quarters, make reductions by 18.75mg-25mg, take 2 or 3 times a day. If you get withdrawal symptoms at any point, slow down. Using a liquid for tapering is very convenient, especially if you wish to taper more cautiously. Using a liquid to taper makes measuring very small decreases much easier and precise. If you can't do any of the above, you may wish to cut up tablets and weigh the fragments with a digital scale to control your tapering rate. This could apply to any type of bupropion -- remember that, when cut up, an XR tablet becomes immediate-release and an SR tablet may retain some of its sustained-release quality. Bupropion is a racemic mixture. The pharmacologic activity and pharmacokinetics of the individual enantiomers have not been studied. The mean elimination half-life (± SD) of bupropion after chronic dosing is 21 (± 9) hours, and steady-state plasma concentrations of bupropion are reached within 8 days. 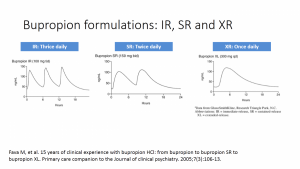 In a study comparing chronic dosing with WELLBUTRIN SR Tablets 150 mg twice daily to the immediate-release formulation of bupropion at 100 mg 3 times daily, peak plasma concentrations of bupropion at steady state for WELLBUTRIN SR ® (bupropion hydrochloride) Sustained-Release Tablets were approximately 85% of those achieved with the immediate-release formulation. There was equivalence for bupropion AUCs, as well as equivalence for both peak plasma concentration and AUCs for all 3 of the detectable bupropion metabolites. Thus, at steady state, WELLBUTRIN SR Tablets, given twice daily, and the immediate-release formulation of bupropion, given 3 times daily, are essentially bioequivalent for both bupropion and the 3 quantitatively important metabolites. TEVA generic of Wellbutrin XL deemed ineffective by FDA. Shipments stopped. "Patients with a prescription for Budeprion XL 300 should contact their doctor for instructions on how to proceed, the FDA said." Budeprion is TEVA generic name for Wellbutrin/bupropion. I have been taking welburtin (bupropion) 150 mg for nine months and I am planning on tapering off of it.. since it is one of the weaker antideppresant is 10% still necessary? I was reading a post and the person that wrote it said that they reduced 50 mg a weak.. Anyone have any thoughts? I don't personally know much about wellbutrin so hopefully someone who does might have something to say about it. When I was on 300mg Wellbutrin XL, initially, I used a compound pharmacy to taper it. Fortunately, I had a good one as they got the ingredients right in spite of my psychiatrist's concern that they couldn't replicate the medication. I was also fortunate to have decent insurance coverage at the time. Many insurance companies will not cover compound prescriptions so your mileage will vary. Anyway, as about 200mg, I decided to see if using the supplements of chlorella and spirilina would help me cold turkey it. For some reason, I thought they would be helpful and I was right. After a day of being tired, I didn't have any symptoms. Of course, what I did as a method of cold turkeying has not been proven so if you try it, you would be doing it at your own risk. Thank you everybody for the advice.. Yes we are all very dif.. I found this out when I quit cold turkey smoking almost a year ago and that was not fun at all...Thank you so much.. I am very nervous about all of this, but i really need to get off of this medication.. I am planning on getting pregnant... Thank you strawberry for finding this thread for me and thank you CS for sharing your experience I really hope that I i can come off of this with out any wd symptoms... I had a questions for the admin.. on top of this discussion it stated that this medication is sometimes used for smoking cessation.. it also says that it should not be used for WD symptoms because it can aggrivate the symptoms were you speaking about quiting smoking wd symptoms? Wellbutrin can aggravate psychiatric drug withdrawal symptoms. It has a stimulating component. Listen to your body, you should be able to go off Wellbutrin with systematic tapering. thank you for your prompt response.. I will be sure to post an update... I went to the doctors office and I feel confident in the way we are going to be tapering off of it.. I feel like a real weenie, but I am having (manageable) WD symptoms on my second cut of Wellbutrin, as well as the first. So I'm going to have to find a way to accurately take smaller, more accurate doses. Do you think I should weigh fragments of the SR tablet with twice daily dosing, or make a solution of immediate-release tablets to take three times a day (major pain in neck)? Or is there another option? BTW not a weenie at all, very sensible. Not sure about twice or thrice daily doses though, someone else asked about this and I would have thought for practical reasons when you get to lower doses and the maths gets fiddly once daily dose would be easiest to manage? That thread has a lot of info that helped me get this far, but doesn't go beyond quartering tablets. I guess I'm the first to need it . The drug has a short half-life in the immediate release version, hence the TID dosing if a solution. My only defense for being so high-maintenance is that it's the 4th drug I've come off starting last summer, first on this website. I would wait longer, but it is too stimulating for me without Zyprexa sedating me. I merged the Wellbutrin discussions. How much Wellbutrin SR are you taking now, Meimei? What kind of decreases have you been making? That does sound like a reaction to the decrease in dosage. Did these symptoms last for only a few hours? Does that give you any other ideas? I am currently taking Bupropion HCL, 75 mg and want to taper off, I have been on for 6 yrs. I'm not even sure wether this is time release or not or how to go about it. So one question is, is it time release? Then how do I do it, can I cut it? I sometimes take it only 6 or 5 days a week and was going to do it that way, but once when I got to 5 days, started getting an excess of nasty, self-critical thoughts. Any advice? Ask your pharmacist if it is timed-release. Read this topic for tips on how to taper with various types of Wellbutrin. Take your dosage consistently to avoid withdrawal symptoms. It's immediate release...that is all 75 mg comes in. You can split tablets or make a solution by dissolving in water. It has a short half-life so you don't want to skip days. I had trouble tapering from 300 mg XL to 150 mg XL. I assumed it would be easy but it was not. It took about a month to get used to not having that extra little bump in energy that I think I got from the extra 150 mg XL and even longer to consistently feel like I did in all ways when I was on 300 mg XL. I felt so crapy for those first week ( very very tired) I entertained the thought of going back up to 300 mg but hung on and did not and I am glad that I didn't. I eventually leveled out and can't tell the difference anymore. Hope this helps a little anyway. I'm currently taking buproprion 150 XL (as well as generic Lexapro 20mg). and although I was originally going to start weaning off the Lexapro first ... that seems more complicated than the buproprion wean. However,I want to be sure that I'm understanding this correctly. Are you saying that at first I should switch from the buproprion 150XL to to a 75SR taken twice a day ... and then cut those pills in quarters so that I can take 3/4 of each pill 2x a day for 2 weeks and then reduce again etc ? That would be one way of doing it. Your response sounded a bit lukewarm. Am I misreading, or do you recommend a different taper? Please read post #1. You can mix and match different dosages of Wellbutrin. If you cut up any type of Wellbutrin tablet, it becomes immediate-release Wellbutrin. I think it's tricky, because Wellbutrin is a weak AD a lot of people taper faster than 10% cuts, and some do fine, a few not so fine. So there is ambiguity in how fast to taper. I felt when I cut the SR tablets, I still got a smoother effect. It is OK to cut them. Cutting an XL tablet will dump the whole thing, plus they are very difficult to break open. You can dissolve the IR tablets in water if you need precise dosing. 75mg only comes as an IR tablet. Good luck! Yes, that might work. You may be able to reduce faster than every 4 weeks. You can get your prescription filled with 75mg tablets, so your quarter-tablets are smaller in dosage. and thanks again for being there ! Good luck! There is a sustained release version (not XL) that you can cut if the immediate release is too...immediate. my question is whether you think that is "safe" ,,, or should I work with my pharmacist to achieve closer to a 10% drop somehow ?? ?